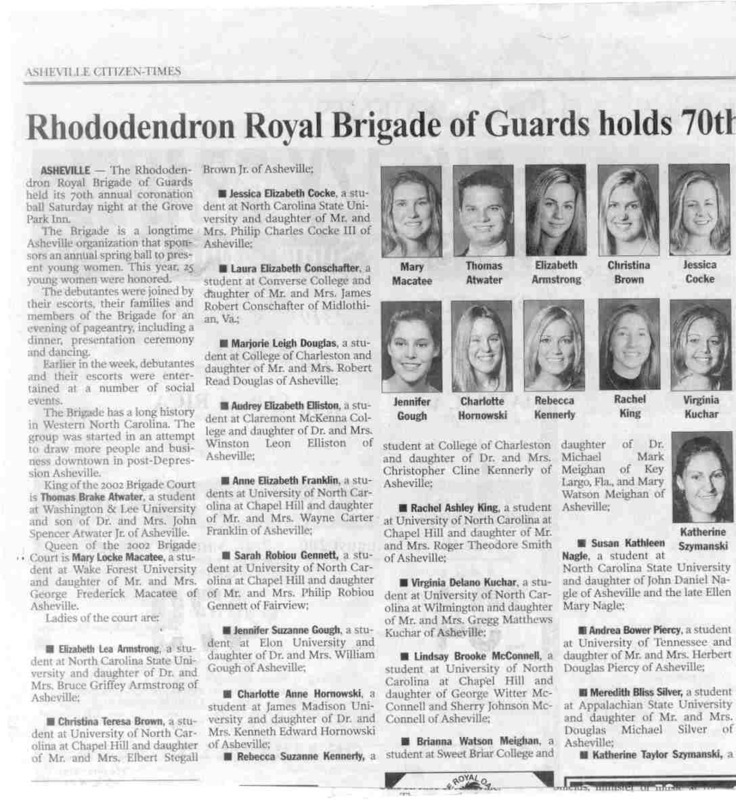 Background: The Rhododendron Royal Brigade of Guards debutante club celebrated its 70th anniversary in 2002. 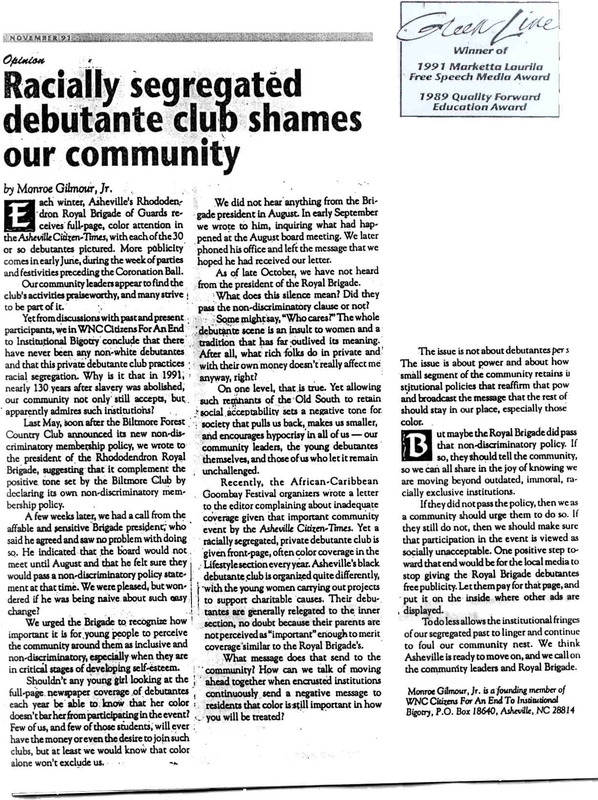 Back in 1991, WNCCEIB challenged the club to review its discriminatory practices. As a result, the club added a non-discriminatory clause to its bylaws. 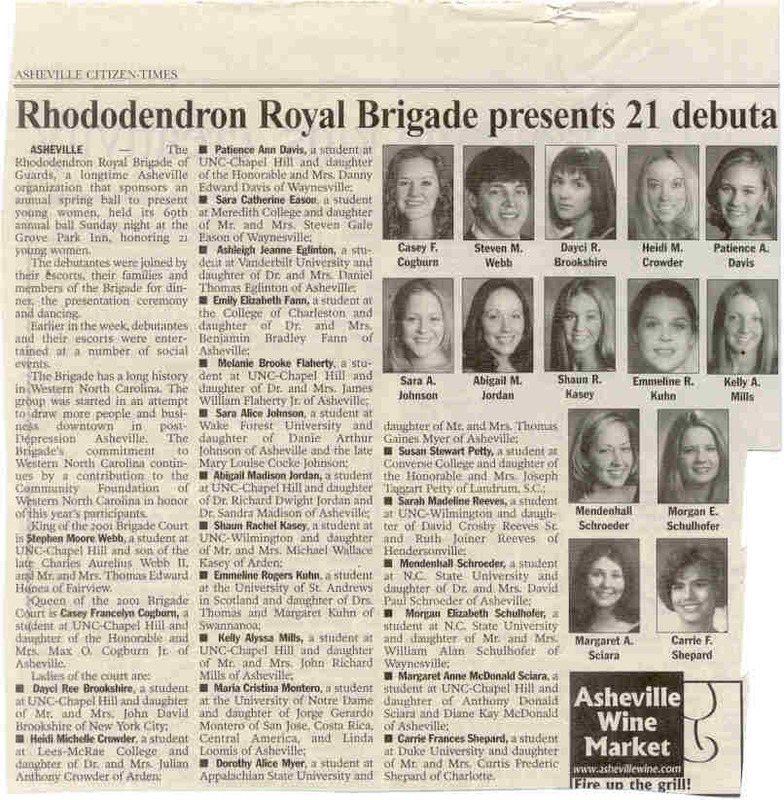 Further discussion led to a 1993 commitment by the club to no further publicity in the Asheville paper until there was actual on-the-ground change in the composition of the debutantes. Prior to that, there were full page pictures, often color, of the white debutantes in February and then two or three more full pages covering their parties and 'coronation ball' in June. In 2000, the club broke its agreement about no publicity and refused to respond to requests for an explanation or to meet for discussions. 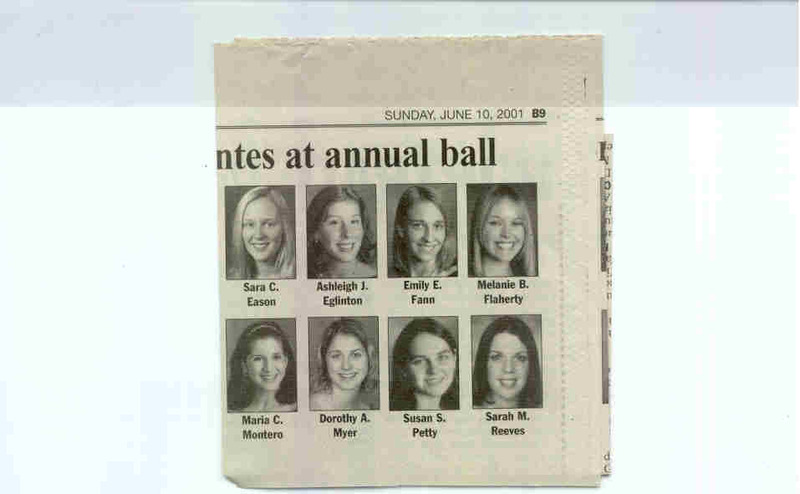 There appears to have been no change in the all-white composition of the annual debutantes. 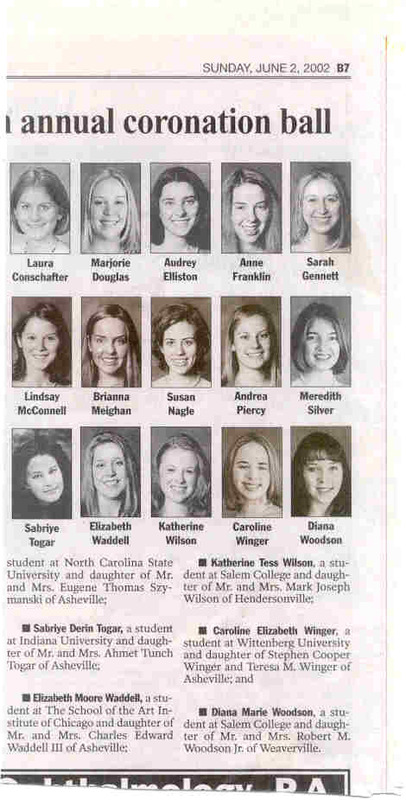 October 23, 2002 "All-white debutantes are free to gather as they wish" Guest Commentary in the Asheville Citizen-Times by Ms B. Fay Parks. In what would seem a spoof but apparently isn't, the author says she finds "their whiteness a refreshing form of diversity" in a nation whose white population is in decline. Ms. 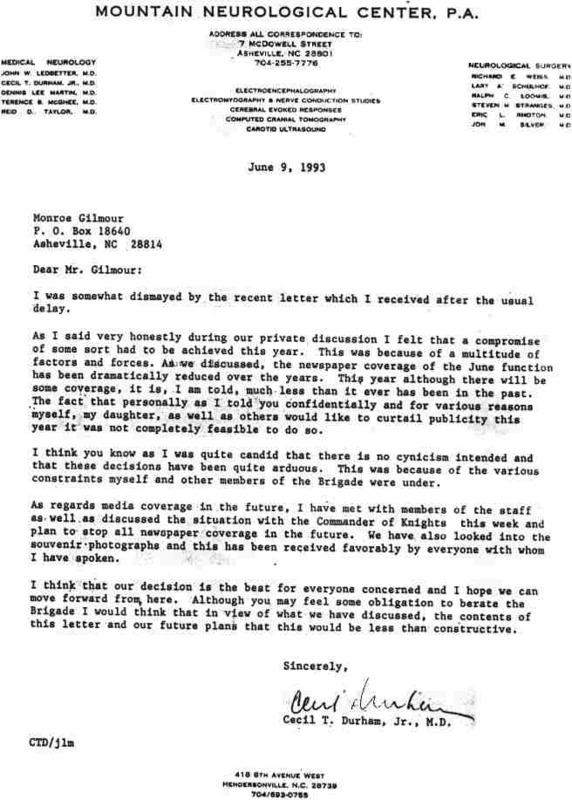 Parks' column is in response to WNCCEIB's column of June 12, 2002 and criticizes WNCCEIB for using its "energies to defame and tear down associations of individuals, leading to an increase in idleness and possibly some degree of misery." 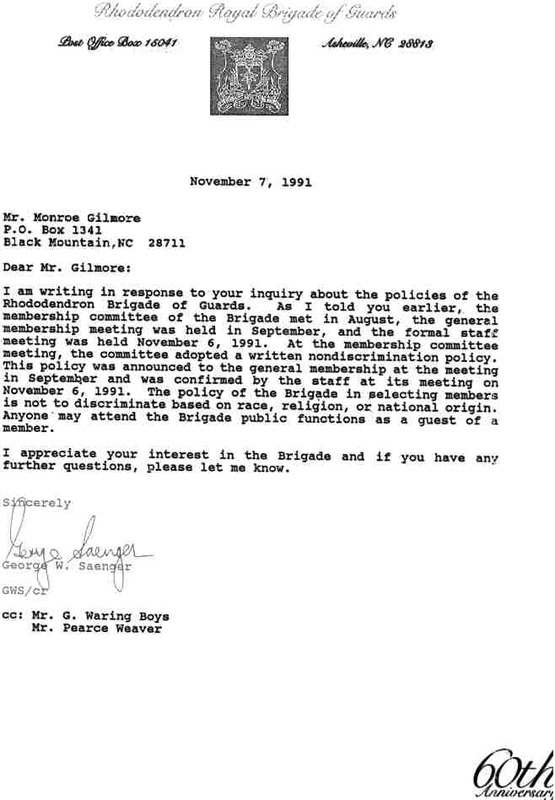 August 19, 2000 WNCCEIB letter to Dr. Norris Crigler;WNCCEIB requests Dr. Crigler to pass along June 13, 2000 letter to Brigade President; he does so. 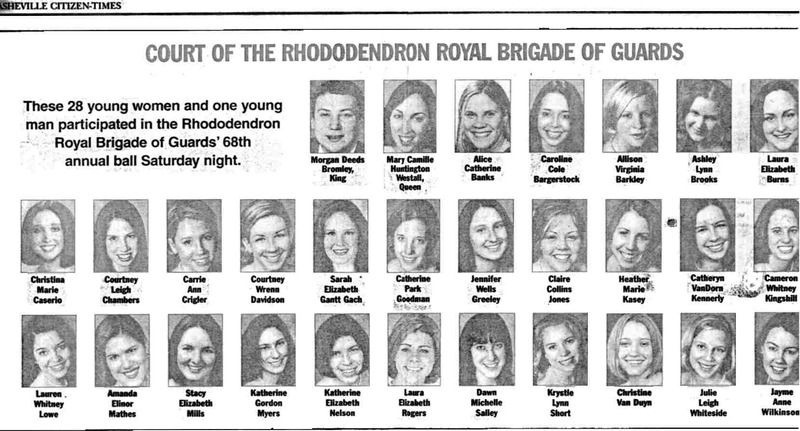 June 11, 2000 Asheville Citizen-Times: "Debutantes presented at Rhododendron ball"
June 9, 1993 Brigade President's letter to WNCCEIB President says Brigade will "stop all newspaper coverage in the future"